Cara Bishop found a willing dance partner in Buddy Banana, one of Walter’s produce mascots at Saturday’s Kids Fest. A Greer Fire Department truck was popular with children throughout the day. Kids got an inside look at the cabin. Tyler Titus, 14, and Demetris Johnson, 3, found potted plants to their liking at the Bi-Lo Kids Fest on Saturday. 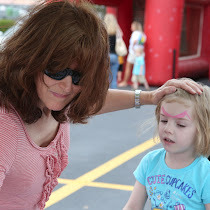 A Kids Fest was held Saturday at the Bi-Lo grocery store at 1365 W. Wade Hampton Blvd. See a photo gallery of the day's activities here.